First of all, a living hinge is not a biological entity nor does it move on its own. Think of the top of a Tic Tac container where the lid and the cover are a single piece, and the thin plastic holding them together flexes to allow you to reach the candies disguised as mints. [Xiaoyu “Rayne” Zheng] at Virginia Tech designed a method of multimaterial programmable additive manufacturing which is fancy-ese for printing with more than one type of material. We love printing in different materials, even if it is only one medium at a time. Printing in metal is useful and could be consumer level soon, but you can print in chocolate right now. Via Phys.org. Thank you again for the tip, [Qes]. Simple tools are great, but sometimes it is most convenient to just use something easy, and since it gets the work done, you don’t try out some of the other features. Tinkercad is a great example of that kind of program. It is actually quite powerful, but many people just use it in the simplest way possible. [Chuck] noticed a video about making a 3D-printed hinge using Tinkercad and in that video [Nerys] manually placed a bunch of hinges using cut and paste along with the arrow keys for positioning. While it worked, it wasn’t the most elegant way to do it, so [Chuck] made a video showing how to do it parametrically. You can see that video below, along with the original hinge video. There are really two major techniques [Chuck] shows. First, he adds the necessary pieces to create the hinges to the Tinkercad toolbox. That makes it really simple to add them to any of your future designs. Second, he uses a combination of numeric parameters and duplication to quickly and precisely place the hinge components across another object — in this case a Batman logo. [Jakob] sent in his method of dealing with broken laptop hinges. Broken hinges are a plague. We have no less than 4 laptops lying around that are beyond repair with broken hinges. Some are just propped up against things, some have had box hinges glued to them and some are just waiting to die slowly from non use. [Jakob] has a nice neat conversion where he basically made a tablet. We’ve seen that before as well as picture frames. His version, while being quite possibly easier than most of the others, has a neat design aspect. An extended lip at the bottom fits in a groove in a plastic slab. 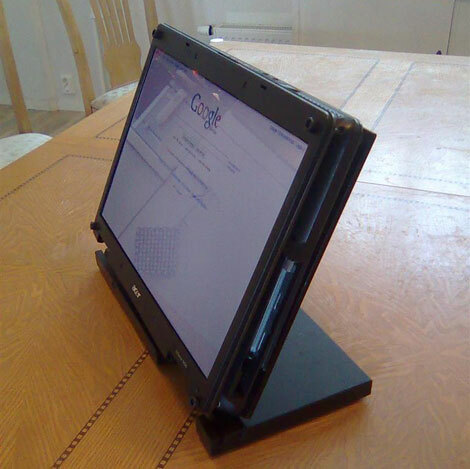 All in one PC becomes a tablet in an instant. Not too shabby for a broken laptop. It looks like he needs to pop a touch screen kit on it though.